It’s been a very long time since I have had a quesadilla…until about a month ago when my husband picked up dinner from one of the Vegan friendly Mexican restaurants in our neighborhood. Knowing that I will eat anything, as long as it’s Vegan, Todd brought me home a Vegan quesadilla and boy was it good. This thing was so stuffed with Daiya cheese, tomatoes, lettuce, olives, beans, Upton’s Chorizo that I couldn’t even eat the other tacos he got me, I was already full halfway though the loaded quesadilla. Needless to say it was my idea to Face Off quesadilla’s this week; I didn’t realize how much I missed them, yet they are such a simple and cost conscious meal to make at home. My version of the quesadilla is Mexican style and almost like a mini burrito. I start with a layer of refried beans, top that with a mixture of veggies and finish it off with Daiya Pepperjack Cheese (which melts perfectly, by the way). Heat refried beans over a low flame until smooth, adding a small amount of water to thin them out a bit. In a bowl stir together chillies, tomatoes and mushrooms. 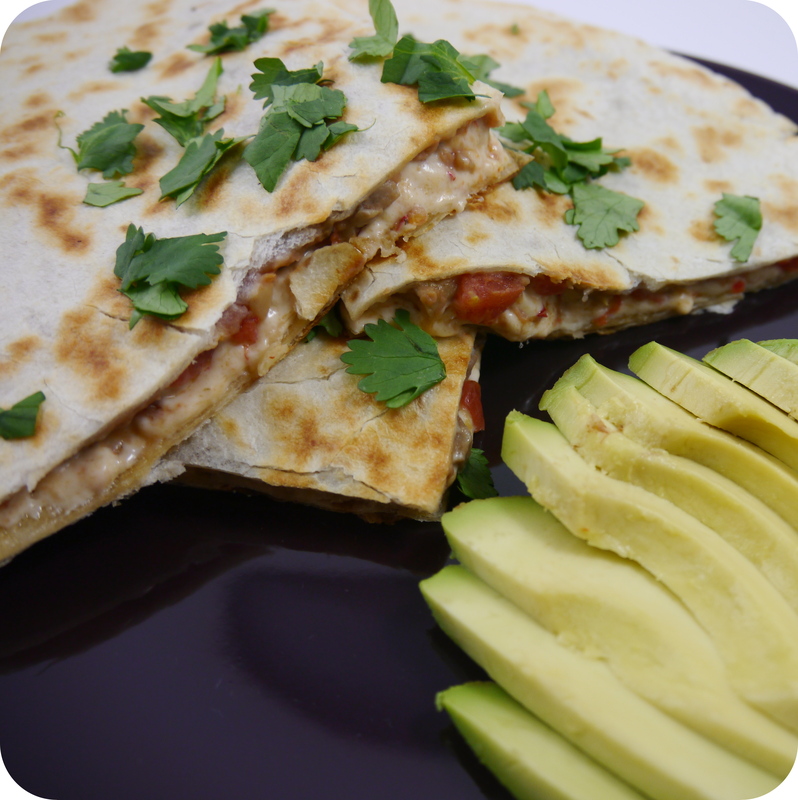 To assemble quesadilla spread a layer of beans on a tortilla, separate the tomato mixture into 4 equal portions and spread 1 portion evenly over beans, sprinkle with 1/2 a cup of cheese. In a un-oiled frying pan over medium heat place assembled tortilla face up and add top tortilla. Allow to heat until bottom tortilla begins to brown, about 3 minutes. Flip using a large spatula and heat other side for an additional 3 minutes, or until browned. Remove from pan and allow quesadilla to settle for a few minutes. Slice into quarters and serve while hot. Garnish with chopped cilantro, avocado and/or vegan sour cream.